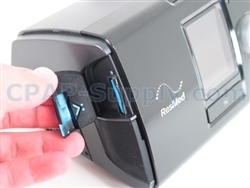 If you haven't checked out the new AirSense 10 CPAP machines from ResMed yet, they're definitely worth a look. The AirSense devices have advanced features that many other CPAP machines don't have. One of those features is wireless communication with ResMed AirView, a cloud-based data collection and data reporting tool. With AirView we can set up a patient profile including your specific machine information - including the machine serial number and machine device number - so that your AirSense 10 machine will automatically transmit data to the cloud after a therapy session. Pretty cool. Here's how it works. Every AirSense 10 comes with a wireless module built-in. The wireless module uses CDMA cell phone service technology, the same technology Sprint currently uses for its cell phone network, and the same technology Verizon used to use before switching to GSM. The service signal strength is displayed on the AirSense 10 color LCD screen in the usual format - five bars in ascending order from left to right. The more green bars, the better your signal strength. According to ResMed tech support, the AirSense 10 will transmit data even with just a single bar of signal strength, but the transmission time may be longer. CDMA is used in North America and some parts of Asia. Coverage areas are generally concentrated around populated areas and along major highways. If you use your AirSense 10 on an airplane, you should switch the device to airplane mode, just like you would with your cell phone. Once we've set up your device in AirView with your serial number and device number, your CPAP machine will automatically send data to us after each session. The data will be transmitted with in the first hour after turning the blower off. Of course, the machine needs to remain plugged into a power source, and it needs to show that it's getting a wireless signal from a cell tower. Once transmitted to us, we can retrieve the data for you and give you the details, or we can allow your primary care doc or any other physician access to the data. The data your machine records depends on the model, but each model transmits just basic compliance and usage data to AirView. The AirSense 10 CPAP will record only compliance and usage data. The AirSense 10 Elite will record compliance and usage data, along with advanced event detection information. The AirSense 10 AutoSet will record all of the same information as on the CPAP and Elite models, plus the detailed pressure data. With the AutoSet device, the pressure will be changing constantly throughout the night, and those changes will be recorded by the machine. There are a few different data plans available to providers. We're signed up for the unlimited data plan, which is $18 per patient/device. This is really the only plan that makes any sense, since it's low-cost and unlimited. If you would like your data transmitted to us automatically after each session, you can pay the one-time-per-device fee and we'll set you up in our system. Just call us with your device information - serial number and device number - and we'll get you going. Some CPAP users absolutely require compliance reporting capability in a CPAP machine. Those who need a license to operate a vehicle in their profession - truck drivers, school bus drivers, etc. - more often than not are required to regularly report compliance data to maintain their professional license. Lots of CPAP machines offer compliance reporting features that, well... comply with Department of Transportation (DOT) requirements. Some machines require separate software to create a compliance report, and other machines require the use of a manufacturer website to generate a compliance report. The ResMed AirSense 10 units are the only CPAPs that offer built-in wireless transmission of the data through a cellular service. My guess is that more CPAP machines will follow with this type of feature, and I'm guessing that some will likely allow transmission through a local WiFi connection rather than through a cellular network. WiFi would be free. Even though professional drivers are on the road and not always connected to WiFi when working (and sleeping after work), I'm actually surprised that ResMed went straight to cellular transmission considering approximately 60% of households in the US have a WiFi connection to the internet. The demographic which describes the average CPAP user doesn't generally include the younger, technology-oriented crowd, so ResMed was probably just playing it safe going with cellular, hoping to avoid problems with users having to setup their CPAP devices to connect to their WiFi. But the reality is that people in all walks of life in every age category are setting up their tablets, mobile phones, TVs, computers and all sorts of devices to connect to their WiFi networks in their homes. Furthermore, professional drivers could transmit data whenever connection to a WiFi network would be convenient, such as on days off at home, or at truck stops with WiFi, so my bet is on WiFi going forward. There's so much copy-cat design in the sleep therapy industry, though, that I think Philips Respironics will probably go with cellular first, just like ResMed, and then switch to WiFi in their next models. We'll see! Call us with any questions about the AirSense 10 devices. We'd be happy to help you.